In a world where Kindles and iPads are trumping the way people flip through the daily paper (negate the fact the everyday man has been seeking out news online for years), newspapers tend to be their own form of endangered species in some households. For those who still feel refreshed after skimming through a Sunday paper, get a little extra mileage out of those quick-to-be-recycled goodies. Most animal shelters and rescues could use the non-circular pages to line kennels of pets looking for homes. Call up the local elementary school or day care to see if they could use a stack of newspapers for any art projects. Nothing screams childhood more than gluey paper mache. If you’re going out of town, chances are you’re NOT going to be reading each section when you get home. Most major publications will allow you to donate the print editions to local schools while you’re out of town via their Newspapers in Education program. Don’t use the coupons in your Sunday paper? Help out a military family by donating the manufacturer’s coupons (valid or expired for up to six months). 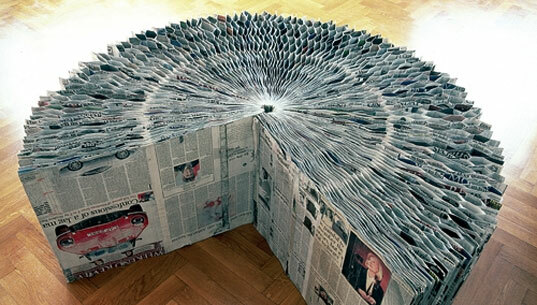 Keep kids busy with this hefty list of newspaper crafts … build everything from a purse to a bow. Is it cold outside? Start a fire by rolling the paper tight and light to use as a starter log. Moving? Keep your belongings in place by packing with crumpled newspaper. If you decide singing in the rain and jumping in puddles is for you, you can put wads of newspaper in your wet shoes to dry & deodorize them in no time. For dozens of more great ideas, check out this fantastic reader-submitted list of newspaper reuse ideas by the Dayton Daily News.